I originally wrote this post in March on Polygon’s forums, but news regarding the sales of Bravely Default made me think the thoughts were worth revisiting. Bravely Default. Literally everything I love and hate about JRPGs wrapped into a frustrating little package. On one hand: Great character system? Check. Entertaining combat? Check. Interesting (if cliche) story? Check. On the other hand: Right as the story starts to get intruiging (the end of Chapter 4, beginning of Chapter 5), the gameplay becomes incredibly grindy. I’m sure back when I was 11 or 12 I wouldnt’ve cared, but now that I’m a Grown Damn Adult ™, it’s become inexcusable when a game shows absolutely no respect for the player’s time. “Of course you have 5 hours a day to play our game!”, the developers say to me with their terrible design choices. It doesn’t help that the game is juxtaposed against Titanfall, a game with nothing in common gameplay-wise, but that says “Oh, do you only have 30 minutes to spare? Want to run and jump around like an idiot and pilot a giant robot?” Why yes. Yes I do. It’s not just an “I hate JRPGs” thing – I played through Persona 4 Golden and it never felt like a grind, perhaps because I was more drawn in by the story and the characters. It was long – very long – but I felt like it at least respected my time and would reward me for spending a few minutes with it here and there. I know I’ll return to it and finish it eventually, if only to justify the time I’ve already spent playing it, but right now, it’s hard to find a reason to do so. Okay, I didn’t build it, strictly speaking – it would be more accurate to say I assembled it. 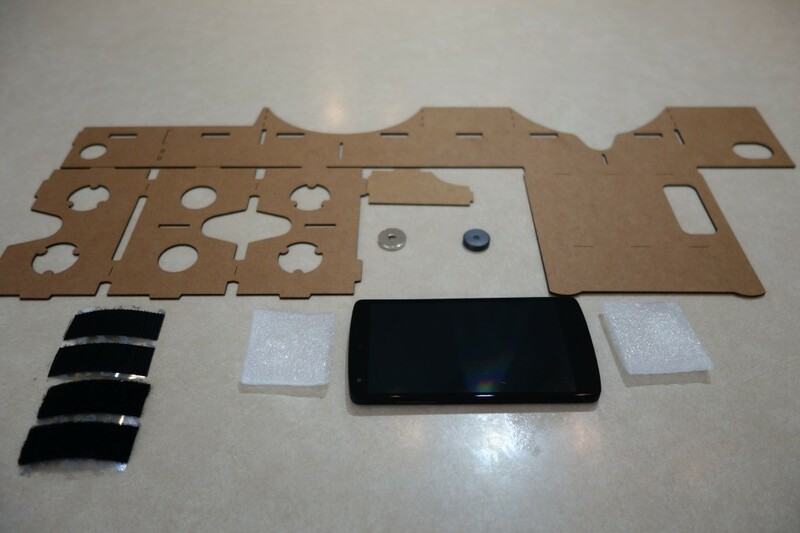 “It”, in this case, would be Google’s “open-source” Cardboard VR headset, made mostly of cardboard (obviously), velcro, magnets, and a couple of lenses. 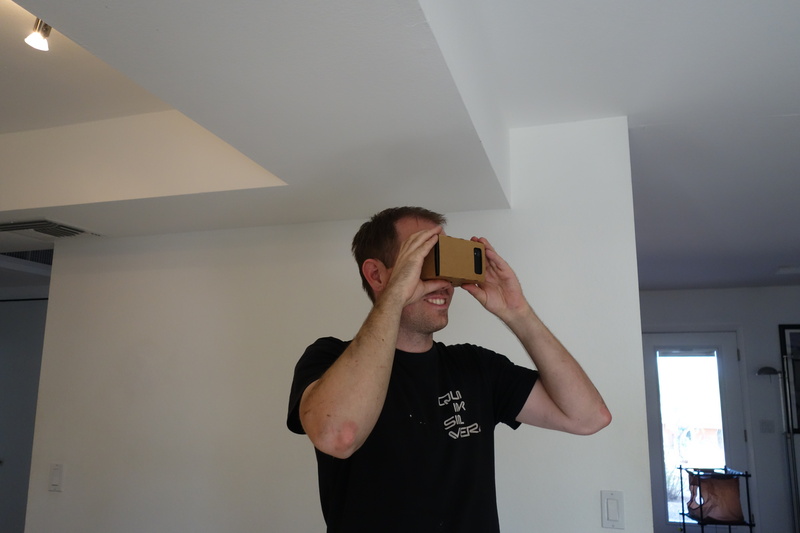 The idea is to leverage the screen and processing power you already have – in the form of an Android smartphone – and provide an inexpensive “dock” that converts that phone into 3D VR experience. The magnets are the only method of control other than the phone’s own accelerometer – they form a “switch” on the side that is, presumably, understood by the phone’s sensors as a “click”. 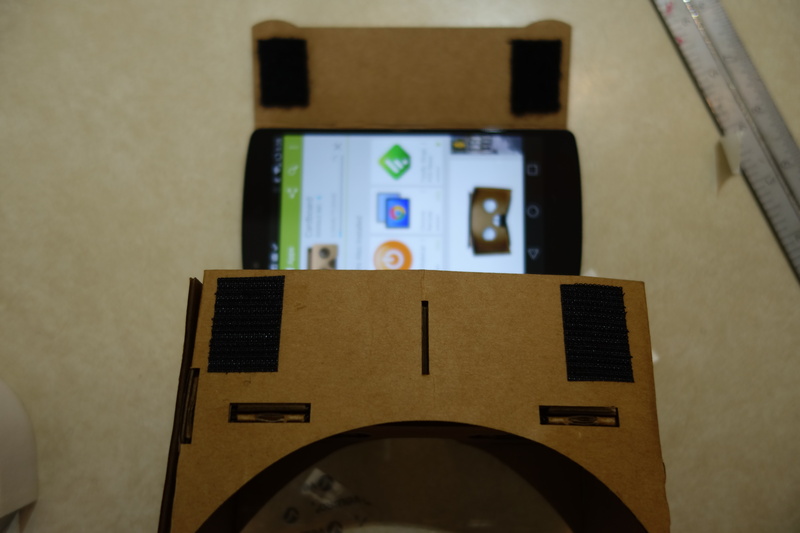 Although the only official Google-provided headset kits were given out at as swag at Google I/O 2014, you can purchase pre-assembled kits from places like Unofficial Cardboard, or follow the DIY yourself instructions and build your own. 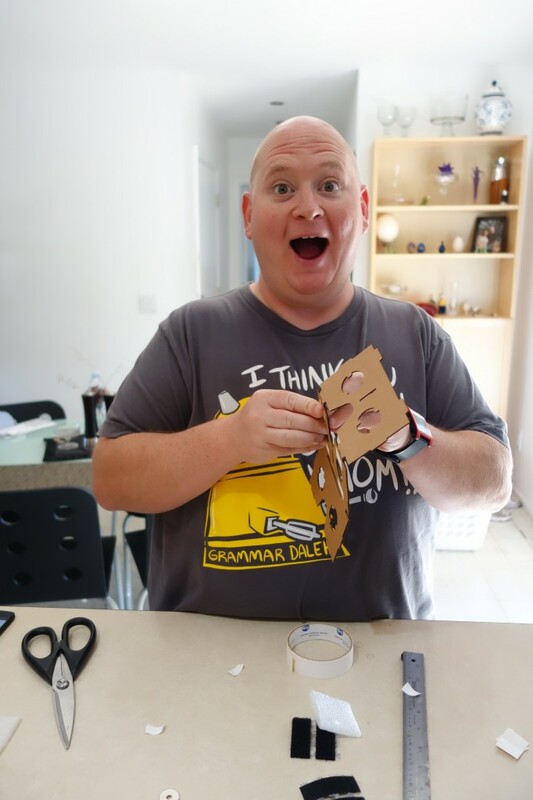 Since my friend Chris had access to tools for precision-cutting cardboard, and is the DIY-yourself Jedi to my Padawan Learner, we opted for the latter. Chris had kindly ordered all the parts we needed, and in fact had assembled his a few days prior. The only parts he wasn’t able to provide were the lenses, which I grabbed for $10 at the afore-mentioned Unofficial Cardboard site. Besides that, the only cost to me was some cheesy bread from Magpie’s Pizza – definitely a worthy trade. Surprisingly, yes!…at least once you work out the kinks of assembly. I’m not the best when it comes to DIY projects, due to a lack of both experience and manual dexterity, so my first attempt at folding the cardboard led to an uneven bottom edge, resulting in a weird double image until Chris and I (well, mostly Chris) figured out what the issue was. I’ve used the original dev kit of the Oculus Rift, and this was actually noticeably better in terms of sheer image quality, almost certainly because the resolution of my phone’s screen (1080p) is noticeably higher than that of the Dev Kit (1280×800). Of course, the practical uses are a bit more limited with the lack of a headset strap and a true control mechanism. Still, these are issues resulting in the fact this is a $15-20 DIY project – the theory of a smartphone-driven VR headset, I think, is sound. 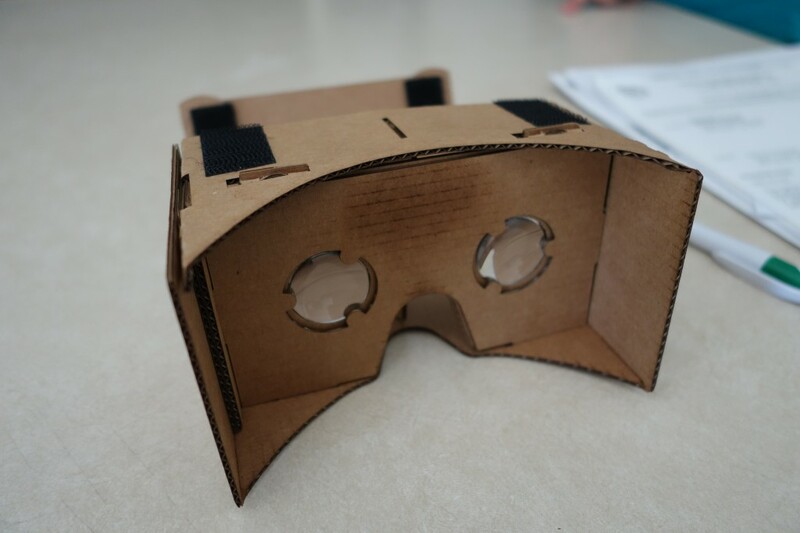 The primary use is Google’s on Cardboard Android app (in fact, you can even program an NFC tag to automatically launch the app when you insert the handset) and their Chrome experiments, though I also found a port of Oculus Rift’s Tuscany demo that was pretty impressive. None of the demos will blow your mind, but they’re also pretty fun and certainly worth the price of admission. There are some decent third-party options; of those, my favorites were probably Tuscany and Dive City Rollercoaster (because Rollercoaster demos are perfect for VR). 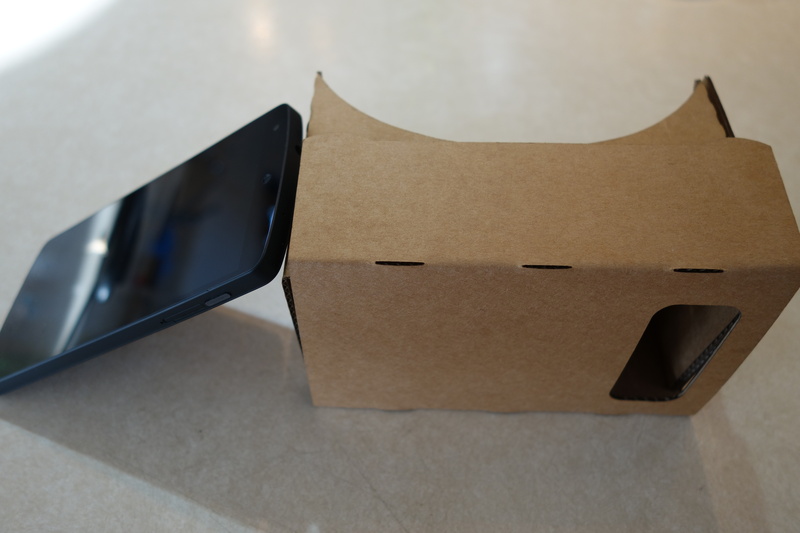 They don’t compare to Google’s own demos, though, since those demos are built around Cardboard’s limited control scheme. Of those, the Windy Day 3D animated short, the Tour Guide tool, and the Google Earth demo are probably the best. The Tour Guide tool isn’t strictly 3D, but is a surprisingly immersive Photosphere-style view and audio tour of several exhibits in Versailles. The Google Earth demo is similar, though rather than putting you in Versailles, it drops you into the sky above one of several random Google Earth locations, from which you are free to look and move around. The image quality isn’t fantastic, but the effect is still pretty great, especially after a few seconds of load time. The big let-down for me is the YouTube demo, which is nice in-theory, but would be more impressive if it was limited to (or at least had a way to filter by) 3D YouTube videos. As it is, you can just watch popular videos on a large “virtual screen”. There is a third-party YouTube app called VRTube, but I’d prefer a way to browse 3D YouTube videos while actually using the headset. That actually leads me into my major complaint, which is that there’s just not enough of an ecosystem developed around Android VR yet. 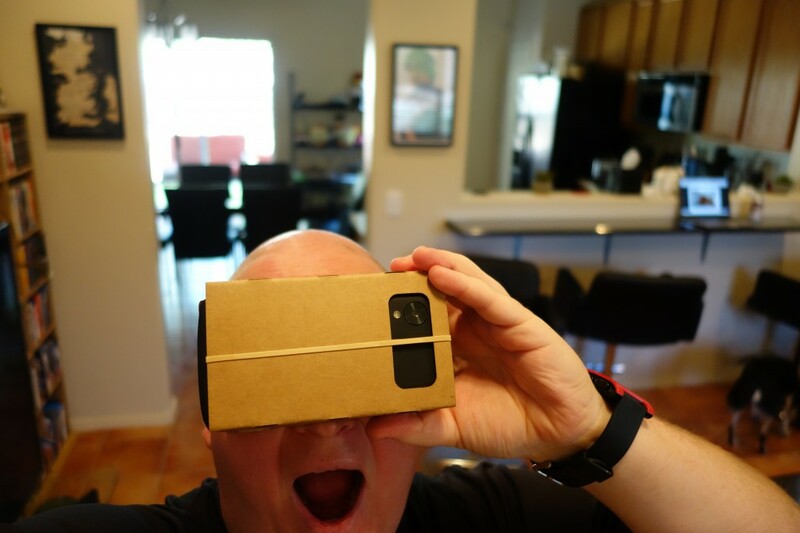 I still long for some basic functionality, like a VR app launcher that work within the headset itself – similar to Google’s own Cardboard app, but extended to third-parties as well. The closest thing I’ve found is Dive Launcher, an app created originally for the third-party, multi-platform Durovis Dive VR headset. It serves as a good first step – and is actually pretty fun to use in-and-of itself. The other issue is that no one else seems to be using the control scheme leveraged by the Cardboard app, which uses a combination of motion and the magnet “switch” on the side for basic navigation. Just having third-party apps support these controls could go a long way. There are also several games that allow you use a third-party controller, but that’s not much use unless you also fashion yourself a head strap. That said, these are all relatively trivial complaints – and I can’t complain too much considering that I’m holding a homemade cardboard contraption up to my face. This whole project has certainly given me a new perspective on the VR trend, and makes me wonder what direction the industry will take. Will standalone headsets like Oculus Rift and Sony’s Project Morpheus rule the day, or would companies and consumers prefer cheaper headsets that leverage the screens and processors that most of us carry around every day? Samsung is already known to be working on their own VR hardware, though it will likely only work with Galaxy devices – and certain Galaxy devices, at that. I’m not sure it necessarily has to be one or the other; there’s no reason these two ideas can’t co-exist and perhaps even support one another as more robust ecosystems develop around VR content. 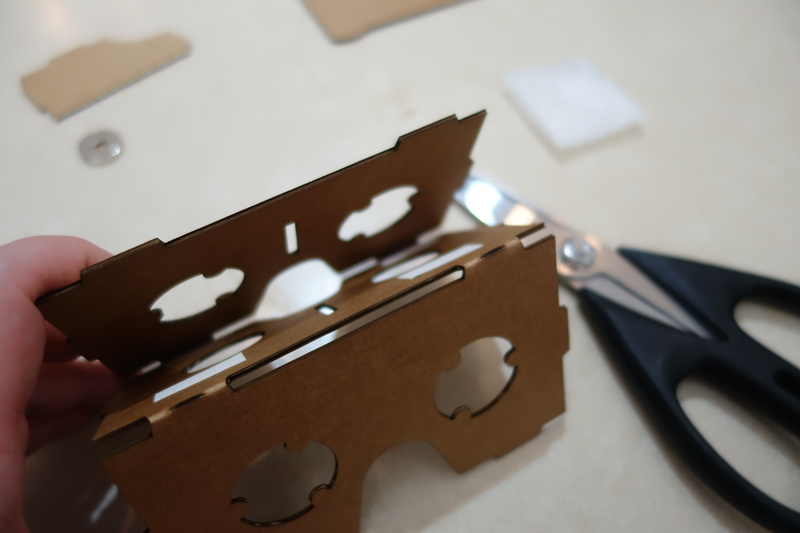 After all, if you make a game or app or video that supports one VR headset, it will likely support others as well – the fact that content originally designed for the Durovis Dive works seamlessly on Cardboard is proof enough of that. Additionally, the concept of VR is so early that there’s really no consensus as to what the UX should be for people using VR devices. Even Google already has two distinct control schemes, one inside their Cardboard app, and one in their Google experiments Chrome page. The more VR devices we have, regardless of type, the more quickly that sort of thing will get fleshed out, and the better all devices will be for it. 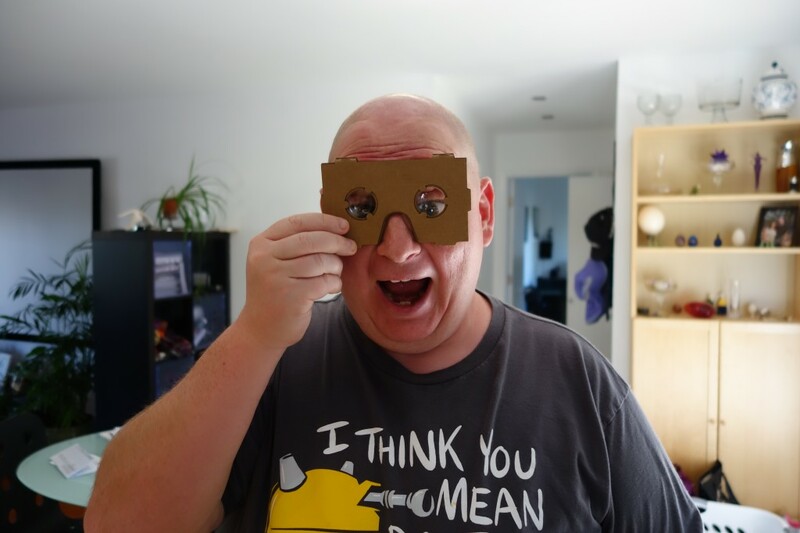 Regardless of how things play out, I am more excited than ever before about the prospect of virtual reality – it’s amazing what we can do today with just cardboard, a couple of magnets and lenses, and a little bit of creativity. Once we start getting some real money and real innovation behind it? Well, I think things will get very exciting very quickly. I don’t have a large amount personal experience with every device listed, though I’ve handled them all for at least a few minutes. If your question is “Should I buy a phone right now?”, the answer is almost always “No”, since there’s always something better coming. This is meant as a guide for the person who needs or wants to update right away. This is written from a very US-carrier-centric point of view, although I still hate the idea of buying a phone through a carrier, and always recommend buying unlocked if it’s an option. That way, you own your phone, and don’t have to deal with carrier bloatware or waiting for carrier approval before getting software updates. Try a phone yourself before buying it; no amount of rambling on my part will take the place of personal experience. You can even buy it if you want, and return it if you end up hating it, as long as you don’t do that too often. The size of the Pro/Con section doesn’t directly correspond to the quality of the devices, but rather my personal experience with them. I’d recommend all of these phones almost equally, just to different people for different reasons. I only consider flagship phones, for the most part – in my mind, your smartphone is the most important piece of technology you own, so it shouldn’t be something you skimp on if you have the choice. Splurge a little; you’re stuck with the thing for at least two years, after all. If you want a cheap, unlocked, solid device, my advice ends with: just buy a Moto G or Moto E.
All of that said – there are, in my mind, four phones worth buying at this point, with a possible fifth and sixth. Pros: Let’s face it, the iPhone doesn’t need much introduction. At this point, you probably know if you want an iPhone or…anything but an iPhone – and both choices are equally valid. The iPhone is your best bet if you want a smaller-sized, one-handed phone with great performance. The 8 MP camera is still nearly-unparalleled when it comes to all-around quality. iOS is either a pro or a con, depending on what you want out of a smartphone. Touch ID is brilliantly implemented, and thus far no phone has been able to match it. Con: Both the size of the phone and iOS itself can be a con, depending on the user. If you want a bigger phone, or if you want the freedom of Android, this obviously isn’t the device for you. Honestly, if you’re okay with the size and with iOS, just stop reading now and get the 5S. You won’t regret it. Really, the only thing I can add is to not buy the 5C unless you really want a colored, plastic phone – the 5S is worth the extra $100. Available carriers: AT&T, T-Mobile, Sprint. Buy directly from Google if you can. Pros: Although it doesn’t excel at any one thing, the Nexus 5 is above-average in most aspects that matters. The build isn’t as solid as the iPhone or the HTC One line, but I’ll take the Nexus 5’s plastic over Samsung or LG’s any day of the week. The optically-stabilized 8 MP camera won’t blow you away, but it won’t often disappoint you, either – especially in HDR+ mode. The size is actually about average among other Android flagships, if not a bit smaller. The software is Google’s idealized version of Android, which also happens to be my idealized version of Android – and it’s also guaranteed to be kept up-to-date for awhile to come. Wireless charging is a great convenience, especially once you have a few Qi chargers scattered between work, home, and your car. This feels, to me, like Google’s version of the HTC One X – which is the phone that made me an Android user, and also a phone I’d probably still be using today if it wasn’t for the 1 GB of RAM and the slightly-underpowered processor. It’s also one of the cheapest ways to get a high-end, unlocked Android device. Cons: The camera, while not the worst, could certainly be better. I don’t even want more megapixels, I just want focusing and imaging performance on-par with the iPhone. The build quality is above-average, especially given the price, but I wouldn’t mind if it was a bit sturdier. Depending on your needs, the size could be a bit large. Battery life can be unreliable, as the battery itself isn’t that big, meaning a rogue app or process can easily take off a decent chunk of battery before you realize what’s going on. It’s not on Verizon, meaning a great many people in the US will never even have the option of owning the phone. Pros: The M8’s most obvious and best features are its design and build quality, which may even rival the fantastic iPhone 5S. HTC’s software is one of the few skinned versions of Android I can tolerate, and HTC has been very, very good about updating their software in a fairly timely manner, at least when compared to other non-Nexus, non-Motorola devices. The front-facing speakers continue to be absolutely unparalleled in the industry. Cons: The biggest drawback here is the 4 MP “Ultrapixel” camera. Some love it and some hate it, and unfortunately you may not know which category you fall into unless you try it yourself. If you ever intend to print your smartphone photos, you should probably stay away – otherwise you may find that 4 MP is actually enough for your needs, especially if those needs are solely social media-related. The physical-size-to-screen-size of the device is also worse than most other phones, mostly thanks to the front-facing speakers. Finally, the phone can be a bit slippery and awkward to hold – again, try it yourself and you should find out quickly if it’s a problem. Pros: This phone is all about being a spec monster. While the build quality is above average at best, the screen resolution, processor, phone-size-to-screen-size ratio, and 13 MP optically-stabilized camera are all among the best of the best. The software, while still not great, is far less offensive than it has been in years past. It has a huge, long-lasting battery that is, unlike the other phones on the list, user-replaceable. Cons: Despite the impressive phone-size-to-screen-size ratio, it’s still a 5.5″ screen, so it’s still a big device – perhaps too big for some people. The software is, at best, inoffensive, and LG is not known for timely software updates – last year’s G2 took about 5 months to receive KitKat, even on unlocked International models. Models purchased through a US carrier will take that much longer. Despite the screen’s impressive (arguably unnecessarily-so) resolution, the colors can be a bit off and the screen won’t get as bright as some others. Pros: The Moto X almost didn’t make the list, based solely on its age and the fact a successor is due soon, but now that it looks like successor might be noticeably larger, I decided to include it. This is the phone to get if you want an Android device with a physical size close to the iPhone 5S, but with a screen .7 inches larger than the iPhone’s. Motorola has taken stock Android and added to it in some fantastic ways with things like Touchless Control; these features are so good, in fact, that Google is gradually stealing them for stock Android. The design fits perfectly in most people’s hands, and best of all, can be customized pretty heavily with Motorola’s unique Moto Maker. Con: The only reason I’d advise against this phone are age and camera. It was already slightly-under-spec’d when it came out a year ago, so I’m not sure it’ll age that gracefully over the 2-year period most people own a phone for. The camera isn’t horrible, but it’s a notch below the Nexus 5, which is already a notch or two below the iPhone 5S. Pros: This is, essentially, a larger Nexus 5 with better specs, a better camera, and CyanogenMod – the only flavor of Android that I might actually prefer to Google’s. Unfortunately I haven’t had the pleasure of using one, so my praise has to stop there. Cons: It’s still basically impossible to order one, thanks to OnePlus’ invite-only system. It lacks the wireless charging of the Nexus 5, and the larger size compared to the already-not-small Nexus 5 could be a negative for some people. I didn’t include Samsung devices because, honestly, I don’t care for their software and hardware choices. That said, the Galaxy phones have only gotten better since the S3, so if you liked the S3, you’ll probably like the S5 just fine. If you’re on AT&T, the Active variant of the S5 might be worth looking at, too. If you want a phablet, then you want a Note 3 – I wouldn’t even look at the others. I’d love to include Sony devices, but as I’ve said, this is a US-centric post, and Sony phones almost never come to US carriers – or if they do, they come about 8 months after their international release. If you’re willing to pay the full, unlocked price for one, though, the Xperia Z2 and the Z1 Compact are both great all-around phones with the added bonus of being waterproof. If they weren’t so pricy unlocked, I would seriously consider getting one myself. None of this is gospel, and all of it is (obviously) one guy’s opinion. If I were to buy a phone today, I’d probably go with the Nexus 5. Yes, there’s likely a successor on the way, but it’s a still fantastic deal and, I think, offers the best all-around Android experience, even if it doesn’t excel in any one particular area. The mobile landscape is constantly changing, and the question “What phone should I buy?” is always a moving target. As the landscape changes, I’ll update this post accordingly. According to the leak, the X+1 will be bigger than the Moto X. The sequel is reportedly joining the rest of the flagship phones and jumping from a 4.7-inch screen to 5.1 inches. I have long-recommended the Moto X to friends thinking about switching to Android from the iPhone, and a big reason for that is the size. Thanks to a fantastic, hand-friendly, small-bezeled design, the Moto X manages to fit a 4.7 inch screen in a form factor not much bigger than an iPhone 5 – and smaller, decently-spec’d Android phones are a rarity in a landscape full of 5+ inch flagships. If these photos are real, it looks like Motorola is taking one of the most important distinguishing features of the Moto X and scraping it in favor of a “me too!” design. The original Moto X was, like the iPhone, all about going for user experience over raw hardware specs, and the nearly got it right – all the Moto X really needed to be the perfect Android device was slightly-faster silicon and a great camera. Unfortunately, it looks like Motorola is getting caught up in the spec race after all. Think for a moment: When was the last time there was a major hardware innovation that actually elevated gaming as a whole? The Wii’s motion controller was great at selling Wii’s, but not at doing much else, and the industry has already (wisely) pivoted away from motion controls. The only hardware innovation I have any interest in at this point is VR, but I feel like that’s still a couple years out from commercial viability. The PC has been keyboard and mouse from almost day one, yet plenty of innovation has happened in PC gaming, because developers are great and creative and the more raw hardware power you give them, the fewer limits they have and the more walls come down between their ideas and the reality of implementing those ideas. It’s time console makers stopped worrying about what gimmick to add to their next console, and instead realize that they are best served by giving innovative developers the tools and the marketplace they need to take their ideas and deliver them to a captive audience. If they want to innovate, give us innovative services that developers can leverage, like cross-buy, cross-save, and remote play – don’t just glue a screen onto a controller or pack your console up with a motion detecting camera and expect those gimmicks to sell your new console. Josh Topolsky, founder of The Verge, is off to Bloomberg, with Nilay Patel and Dieter Bohn stepping up at The Verge as #1 and #2, respetively. As you might have heard, I’m stepping in to be the next editor-in-chief of The Verge. I’m also excited to announce that my friend Dieter Bohn will be our new executive editor. We’ll be working with the amazing team that’s already in place and making The Verge happen every day, a team I think is the best in the industry. This is going to be rad. Nilay and Dieter are two of my favorite voices in the industry, and given that Topolsky has been largely AWOL at The Verge for the last few months, I’m pretty excited for this change. Hopefully it’s the breath of fresh air that I feel The Verge has been waiting for since the hiatus-ing of the Vergecast. You may or may not know that you can use voice commands on your Android device to quickly dictate a note by saying “OK Google, note to self” followed by whatever you want the contents of that note to be. By default, this goes into Google Keep, which is somewhat useful, but I don’t actually use Google Keep for all that much – somewhat ironically, I use it mostly to jot down things I don’t plan to keep long-term, like shopping lists. However, thanks to the extensibility of Android, Google Keep is just one of several services that the “take a note” command can tie into. For me, the most useful one by far is any.do. I might use Google Keep and Evernote, but I need my to-do list – it often drives my entire day – and any.do is still the best multi-platform to-do list I’ve found. Ever since I discovered I can create a to-do item simply by saying “note to self”, I’ve been using it pretty constantly. The fact you can now activate voice commands from almost anywhere in Android just makes this all the more useful, especially when working out or driving, where a lot of my random thoughts and ideas decide to come to me. Even when the voice transcription isn’t perfect – “review Art’s email” turned into “Review artsy mail” – it’s almost always close enough that I can decipher what it’s referring to. Would you buy a Wii U without the GamePad? it’s just basically a last generation console with Nintendo IP’s. Funny thing is, a large number of people are actually okay with that; Nintendo makes great, gorgeous games and finally having an HD console means the tech is catching up to the art design. I don’t own a Wii U because of the price. Why is it so expensive? The GamePad. What games do I want a Wii U for that I’d need or want to use a GamePad with? 0. It might finally be time for Nintendo to realize – as Microsoft did with the Kinect – that their expensive gimmick just isn’t working. People buy a Wii U in spite of the GamePad, not because of it. I still wish Nintendo had released a traditional console that competed directly with the Xbox One and PS4, but I’d also settle for a $150 Nintendo-game-only machine. $150 might sound ridiculous until you realize that the cost of a replacement Gamepad is apparently $140 – almost half the price of the Wii U itself. If you subscribe to Apple’s philosophy, iOS 8 and OS X Yosemite will reward your faith. While iOS and OS X have shared certain services and features since 2011 or so, this year’s releases will take that interoperability to the next level under the “Continuity” banner. Yes, for those of us who prefer to live in between ecosystems, Continuity takes today’s vendor lock-in problems and makes them even worse. For the large number of people who own and use multiple Apple products, though, it promises to make your devices work together in ways beyond simple data synchronization. Continuity is the siren call attempting to lure me back into using iOS devices. Sure, I can emulate much of Continuity’s functionality using third-party apps and services on Android, but there’s a lot to be said for having it all natively baked in. 2015 is going to be a very interesting year, and a year, I think, that will determine which device “family” many people – including myself – end up living with for years to come.